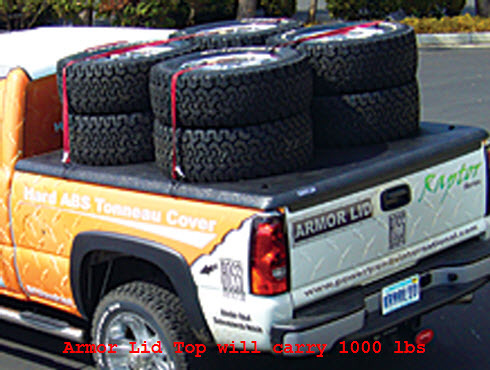 Armor Lid is a hard truck bed cover made of ABS plastic and supports 1000+ lbs. The Armor Lid Tonneau Cover has been discontinued. This decision was part of Power Trends Internationals ongoing efforts to consolidate and focus the company's efforts on other product lines. Any and all warranties are void after January 1, 2013. Replacement parts will be available for sale for a limited time while supplies last. If you spring leaks in your old Armor Lid your can try using some universal absorbent mat protectors to soak up the water and mud that attacks your truck bed. For anyone seeking to buy an Armor Lid, a similar tonneau cover product with comparable strength and material characteristics is manufactured by UnderCover Tonneau Covers and is readily available in the marketplace for aftermarket automotive accessories. Note: The Armor Lid website is now down (2/26/2015) and is no longer available to help you with any needed spare parts or repairs. Anyway, just in case this product is resurrected here's some info. The Armor Lid Tonneau Cover made by Power Trends International is not like most hard tonneau covers you know. It’s made of LG ABS polymers and is desinged to hold in excess of 1000 pounds on top of itself and still be easy to remove (it takes about 2 minutes), This hard truck bed cover uses a dual lock system for security and has double bulb gaskets all around to make the seal with your truck bed near waterproof. What more could you ask for? The only possible negative is when your Armor Lid is locked down, you can’t open the tailgate. But, I guess that’s a positive for you security freaks out there that transport gold bars in the pickup. Cover Weight : Approx 110+ Lbs. This Tonneau Cover has been discontinued. This decision was part of Power Trends Internationals ongoing efforts to consolidate and focus the company's efforts on other product lines. Any and all warranties are void after January 1, 2013. Replacement parts will be available for sale for a limited time while supplies last.